“Seldom in man’s history have we created something as beautiful and as functional as the sailboat. These boats symbolize more than just basic transportation. They represent the ability of man to work with nature. To harness the power of the wind and endure the strength of the sea is an awesome achievement. 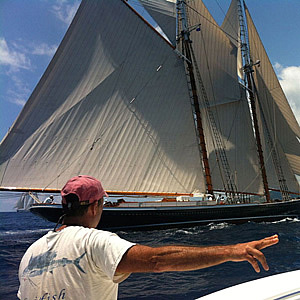 Rarely has man made a machine that perfectly meets his needs and is as beautiful and graceful as the sailing vessel. While modern methods of transportation may appear to be more efficient, their negative impact on our ecosystem is very noticeable, thus raising questions to their long-term impact on our fragile natural world. As to the esthetics and the romance of sail, few inventions evoke more emotion than the majestic yachts and square rigged ships fighting through storms and calms to reach a new land and deliver its passengers and cargo safely on a new shore. “The location where the seas meet the land is a magical place. 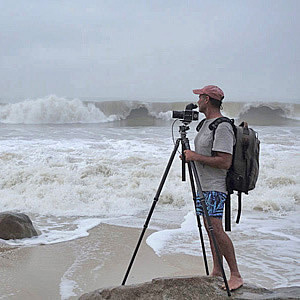 It is where we can see an unobstructed view of the continuously changing power of the ocean. As we gaze out over the water, our minds are allowed to run free. We think of the mighty storms, early discoverers and dream about what lies on the other side and of the life below the surface. The seashore is enchanting place where sounds of crashing waves fill our ears and low slanting sunlight illuminates the wind blown spray off the rolling waves. Behind the dunes, covered in sea oats, lay the marshes; teaming with life, they are the nurseries of the sea. Many inhabitants of the seashore are endangered due to man, for we flock to the ocean and its tributaries trying to capture a piece of this magic. These tributaries, marches, and beaches are home to many species and it is of great importance that we protect these sensitive areas. Contact Galleria Silecchia for complete information on the handmade photographs of photographer, Michael Kahn.